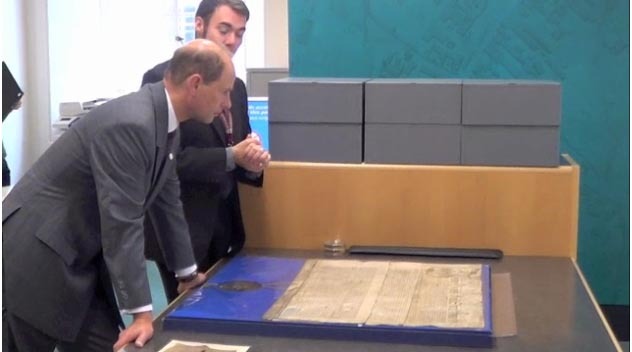 On my regular visit to the Archives this week I was privileged to be amongst the first people to see their latest acquisition, documents from the very earliest written history of Barnsley and area. The parcel of documents was delivered from Sheffield Archives to Barnsley, which, with the completion of the new secure, climate controlled storage, is now able to give these old documents a proper home in their place of origin. 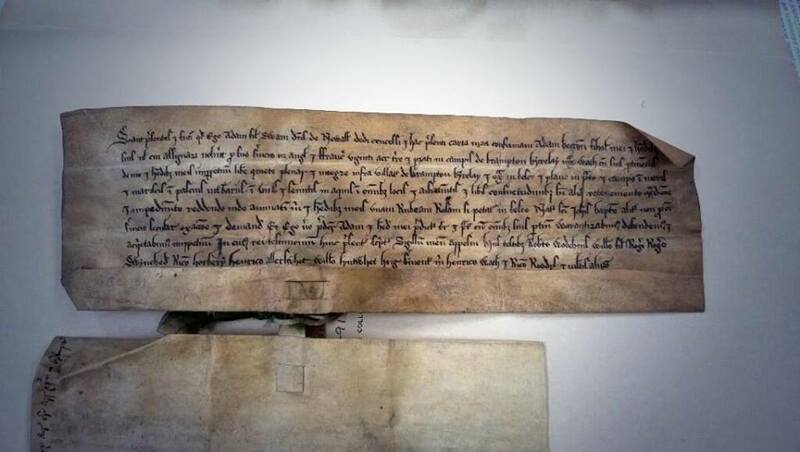 This is the oldest document of all, a small piece of vellum, about 2 x 6 inches in size, which dates back to 1150. It records the grant of a piece of land from a man to his god-son; all he asks in rent is one red rose each year. Sounds insignificant, but then just think about it ... 1150 was only 84 years after the Norman Conquest and the ruler at the time was Stephen, the grandson of William the Conqueror. If you remember your history (or you watched "She Wolves, England's Early Queens" recently), that's the time when there were constant wars between King Stephen and his cousin Empress Matilda, who as a woman was not the most popular candidate for the English throne. A transaction of land for a mere token seems strangely sentimental in a time we associate more with knights and swords and sieges. I'm no Latin scholar (my grade B 'O level' was over 30 years ago) but even I could make out the name Adam and a place, Wath, mentioned in the document. The writing is neat and crisp and stands out clearly from the brown speckled background. The thought that I was looking at something written 863 years old was stunning. 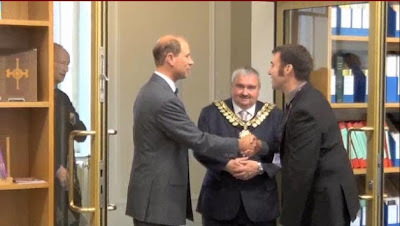 Then on Friday the Archives was visited by Royalty, so Paul had to put his suit on again, the second time in a week, the first being for the launch of the digitised Barnsley Chronicle on Tuesday. Sorry, Paul, but I've got used to seeing you in the corporate polo shirt mingling with the rest of your staff, so when you put the suit on now we know there's something up! I see from the video on the Star newspaper's website that the Prince chatted to some of the people using the Archives yesterday and had time to look at some of Paul's new acquisitions. Is that the oldest document at the bottom left of the picture above? I think it could be - I saw that before the Prince! Well done Barnsley Archives! And well done Experience Barnsley and the team behind it, over 40,000 people have now visited the museum and with the launch of the 'Romans are Coming' exhibition I'm sure thousands more will be visiting in coming weeks.